The man, the reader learns, is Nate McClusky, recently released from a five-year prison sentence, but not before murdering a fellow inmate who turns out to be a member of Aryan Steel and also Crazy Craig’s brother. The woman is Avis, Nate’s ex-wife, who Nate learns is already dead upon his release: murdered, along with her boyfriend, by Aryan Steel, their promise for revenge already being set into motion. The child is Polly McClusky, Nate’s estranged 11-year-old daughter, an odd little girl who seems uncomfortable in her own skin, an unlikely hero, but that’s exactly what she becomes in this neo-noir, contemporary coming-of-age tale. Polly doesn’t have many friends. She still carries a tattered stuffed teddy bear in her backpack. Then one day her dad, recently released from prison and driving a stolen car, kidnaps her from school, and they speed away with no time for an explanation. Like the reader, Polly doesn’t know what’s going to happen to her, but there’s a sense it will be something dramatic and life changing. Yet in keeping with what one of the characters, a cop named Park who is in pursuit of Nate and Polly, says: “The best thing you could do in this world was find the thing that jolted you the most and killed you the least, and go after it hard.” Which is exactly what Polly starts to do. Polly learns a lot in the time spent on the lam with her father: how to rob, how to fight, how to survive. But most importantly she emerges as a strong young girl, one who can rely on her wits and physical strength for survival in the dark underbelly of society. Unfolding with a pace that makes the book feel more cinematic than anything else (most likely a testament to the author’s background as a screenwriter) and with sentences that are clipped, terse almost to the point of being disconcerting at times, the novel sustains its momentum, and the unlikely father-daughter pair begins a series of adventures and close calls as they run from Aryan Steel, moments that not only strengthen their relationship, but also Polly’s sense of herself and her place in this dark, grown-up world of crime and violence in which she has been suddenly and unwittingly flung. 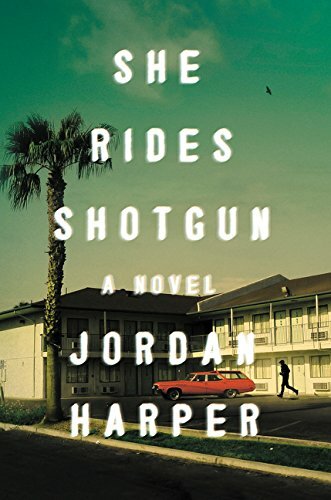 It is a world of white supremacist gangs that seems to be otherwise neglected by contemporary literature—one thinks of the 1998 cult classic film, American History X, as one illuminating example—and this novel does well to expose the darkness and depravity (but also the frightening power and influence that this subculture seems to wield, both inside and outside of prison walls). It is through Nate’s and Polly’s encounters with hateful, heartless thugs and drug dealers, people willing to kill at the drop of a dime, that the reader sees the inherent dangers of being even tangentially involved with such a group. Perhaps this novel could even be read as a cautionary tale, a dire warning about what happens when one commits oneself to a life of violence and crime. Finally, in what is perhaps the most poignant image in the novel, when Polly and a friend are riding off into the sunset (in Harper’s skilled hands, this functions more as a successful trope than the cliché it could easily become), Polly notices the light in the Los Angeles sky, stating that what makes the sunset so beautiful is “‘dirty air,’ . . . ‘Light bouncing off the trash in the air, it splits up the light. Makes it pretty.’” And that seems the most apt description of Polly herself—her myriad imperfections making her beautiful and whole. Which is all anyone in this world can ever really hope for. David Armand's most recent book is the memoir My Mother's House. His first book, the novel, The Pugilist's Wife, published in 2010 won the George Garret Fiction Prize. His most recent novel, The Gorge, was shortlisted for Foreword Review's Book of the Year Award.